I enjoy making (and drinking!) 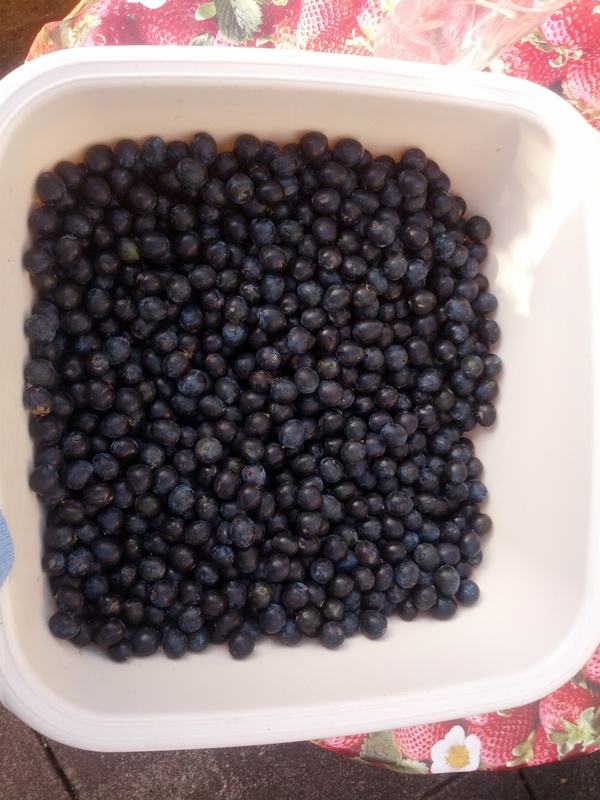 sloe gin and here is the secret history and recipe of what I call my Gallows Gin. Not because you’re left hanging or legless, but because we collect the sloes from the local Whitley Common, where there was a gallows in the 18th & 19th Centuries. The hanging went wrong when only one bolt was released, causing the jailer Mr Carter to step in to withdraw the second bolt. As Mary Ann’s body lay hanging, several people followed a local custom whereby they rubbed the hand of the corpse on wens (cysts) on their necks, believing this to cure them. Her body was later dissected by doctors and laid out for public inspection. Her ghost was rumoured to haunt the Common, dressed in the same clothes she was hanged in. On one occasion, drinkers at the Crown Inn wagered a gallon of ale that one of them would not go to the Common at midnight to ask Mary Ann’s ghost how she was. His friends secretly hid themselves on the Common, so that when he asked ‘Mary Ann Higgins, how are you?’, he received the reply ‘Wet and Cold’, sending him running scared shitless back to the pub. At the turn of the nineteenth century, there were also reports of white blobs on the Common hovering in the air and making coughing and groaning noises -which in the cold light of day actually turned out to be an asthmatic piebald cow. This is a recipe I have adapted from others I have seen or had given to me. It’s not as sweet as manysloe gins, more of a ‘warming mulled gin’, which works fine for me. 450g sloes (washed, topped and tailed – traditionally they should be picked after the first frost in September, but I’m always paranoid that someone else will have nabbed them all by then, so pick them when you can and feeze them after washing (which also helps them to ‘burst’ ,otherwise you have to prick every single one which is a tad tedious and may lead you to drink the neat bottle of gin ( making you a Hopeless Old Lush – see below). I’m sure more traditional people use an abundance of speciaised equipment (such as fancy, sterilised kilner ‘sloe gin’ jars), but I empty out cheap 1.5 litre supermarket water bottles, bung in the sloes, then the sugar, then pour the gin in through a funnel. I turn it daily – at least for the first week – as the sugar needs to dissolve thoroughly, and leave it in the bottle for about three – six months , although I have let it for up to two years, before decanting. Again, posher people will use muslin cloth for the decanting into pretty little bottles, but I find a paper coffee filter liner works equally well. Sit drinking it in gin teacups (NOT straight from the bottle, have some class!) round an open fire at Christmas, regaling guests with the ghost stories above. Let me know if you enjoy it – or see any ghosts. This entry was posted in Uncategorized and tagged Christmas, Drink, gallows, Ghost, ghosts, Gin, hanging, lament, local history, lush, Mary Ann Higgins, Prunus spinosa, recipes, Recreation, sloe gin, Spon Street, warwickshire, wens, Whitley Common. love it darling. and am loving this newly inspired blog.